Barcelona talisman Lionel Messi is well on his way to another European Golden Shoe as his hat-trick against Real Betis helped him extend lead over rivals in the scoring charts. The 31-year-old magician scored his 45th hat-trick for Barcelona last night against Real Betis in the La Liga. It was Messi's 33rd hat-trick in the Spanish League as Barcelona emerged as comfortable victorious from the clash. Messi opened the scoring with a spectacular free-kick before finishing from a sublime Luis Suarez pass. The Argentine was not done yet despite Barcelona leading and scored a brilliant goal from his left foot in a tight area to complete his hat-trick. Messi's performance earned the admiration of rival fans as they applauded him after his third goal. The 31-year-old depicted why he is still football's finest and statistically way ahead of his rivals in the current campaign. Meanwhile, Cristiano Ronaldo did not feature in Juventus' 2-0 loss against Genoa but Kylian Mbappe scored one in PSG's 3-1 win against Marseille. Messi leads the goal-scoring charts in Europe's top five leagues and hence, leads the race for the European Golden Shoe. He has scored 29 goals in the Spanish top flight and his closest competitor is Kylian Mbappe, who is three goals behind him. The next three spots in the scoring charts are occupied by Sampdoria ace Fabio Quagliarella with 21 goals and by Cristiano Ronaldo and Krzysztof Piatek with 19 goals. 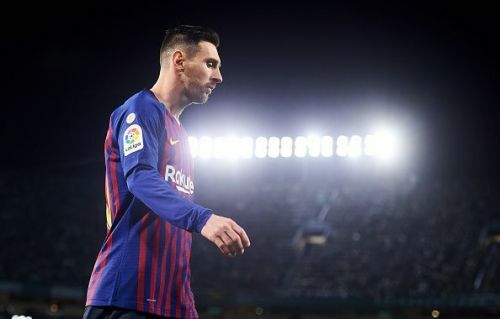 Messi is already the player to win the Golden Shoe more than anyone else and it seems likely that he will lift the award for the sixth time if Mbappe fails to outscore him in the remaining 10 league games of the season. It still remains to be seen whether Mbappe can outscore Messi as we progress towards the business end of the season. Barcelona will face Espanyol next while PSG take on Toulouse in their respective league when football resumes after the international break.